I recently decided to buy a ukulele – a decision which quickly left me overwhelmed by the choices before me. I discovered that the price for these instruments range anywhere from $14 to $9000 (at least those were the prices on Amazon) and that ukuleles actually come in 4 different sizes – soprano, concern, tenor, and baritone. It only took me a few minutes to realize that I needed a lot more information to make an informed decision on my purchase! The same uncertainty that I felt as I scrolled through page after page of ukuleles is what businesses often experience when they speak with web designers. If you think there is a wide range of prices for ukuleles, you should look at the price range for websites! You can get a website for almost nothing by using one of the cheap, template-driven solutions available, while on the other side of the spectrum, some companies have spent millions on their sites. Talk about price diversity! How do you know what the right solution is for you and how do you ensure that you are getting value for what you spend? These are the questions that companies ask themselves when they are considering a new website project – the same questions that I was asking myself as I went shopping for a ukulele. During my ukulele search, I read an article that said that buying a super expensive instrument did not make sense for a beginner, but that buying the cheapest ukulele was also not a great idea. It is easier to get a good sound out of a quality instrument than it is to do so with a cheap one. Many people new to ukulele, or to any instrument, get discouraged early because of the way their playing sounds - so if you buy a junk instrument, you are making it even more difficult on yourself. This same principal applies to websites. While it is unlikely that you need the most expensive website possible, those low-cost, cookie-cutter websites are not the right fit for you either. The low price may be attractive, but you get what you pay for. Just like it is hard to get a good sound out of a cheap instrument, it is hard to get good business results out of a cheap website. Template driven “starter websites” that come as part of package often introduce more problems than they solve. Most companies quickly outgrow these sites, but they then have difficulty moving away from these services for a variety of reasons. A better option is to make a strategic investment that makes sense for your business by starting with a quality website from the get go. When it comes to buying your first ukulele, the most expensive ones are unnecessary and the cheapest ones will just frustrate you. The best plan is to go for one that is somewhere in the middle – an instrument that is affordable, but well-constructed. For my own purchase, I decided to go with an instrument from Luna Guitars (not the one shown in this post). The ukulele is 100% koa wood, as opposed to lower-priced instruments that use laminate on top of the ukuele and cheaper woods for the rest of the body. 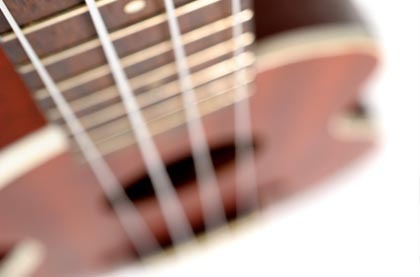 As soon as I began playing the ukulele, I was happy that I had not gone with a cheap instrument, but had instead spent a little more to get a better one. This “middle ground” is also where many companies can find the most value and success with their websites. There will always be organizations whose needs are so complex that those million dollar websites are where they need to be, but if you are a small to medium business that wants to make new customers aware of the products or services you offer, then that million dollar site is not only out of reach, it would be overkill for you. That being said, the “free” website provided by your hosting company is also not going to work for you. If you want your website to look great, work well, and help you communicate your message effectively, be prepared to work with a professional team that will design and develop a solution specific to your needs and goals. That, I am sure, is music to anyone’s ears. Much thanks to the website ukulelehunt.com for helping in my search for the perfect instrument for my needs, and also to Jeff Burton for his wonderful series of YouTube videos on “ukulele for beginners”.